The Christmas Season was in full swing when the air force transferred me from New Jersey to California. I could have flown, but with an ample travel time. I took a train. The sun was low when we reached Chicago, grabbing my B4 bag, I found a Yellow Cab waiting on the street. “I’ve heard about The Loop at Christmas. Take me to a reasonably priced hotel so I can see it for myself,” I told the driver. “Yes sir, hop in, I’ll put your things in the trunk,” said the driver. After pulling away from the cub, he pointed out famous landmarks while i watched the meter. Minutes passed, perhaps fifteen, I was wondering if I was ‘taking the tour”. But before it read four dollars he wheeled up to the curb.“This is as close as you’re gonna find a bargain,” he said. Outside stood a large tan and brown building that might have covered a quarter of the block. 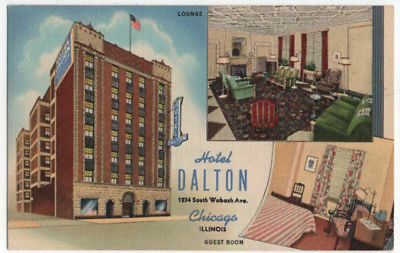 Above the entry were the words: Dalton Hotel. I passed him a five-spot and he set my bag on the sidewalk. Inside, the lobby was filled with men I took to be truck drivers, judging from the company names on their shirts – Overnight, Watson Bros., Roadway, to name a few. This place had the earmarks of an A1 hotel, back when, but it was headed downhill. The clerk, a heavy set man with a pockmarked face and tired eyes signed me up for room 404 and then pointed a stubby finger toward the lift. “Take a right when you reach the fourth floor,” he said, then returned to a stack of papers he’d been sorting when I arrived. I waited for a bell boy to appear, but none came, so I grabbed my bag and headed for the lift. It was a relic, something out of the Machine Gun Kelly or Pretty Boy Floyd era. The door was a decorative steel mesh work, that protested when disturbed. But as the latch click a panel of buttons sprang to life. Pressing button number four caused the lift to shudder. Three or four relays clicked, and then it growling to fourth floor where it came to a jerking halt. Visiting The Loop was a worthwhile adventure. The lights, decorations and music gave me the Christmas spirit, but I didn’t stay long. The following morning I rode the lift down to the lobby. All the truckers were gone except or eight or nine wearing Roadway patches. They were younger than me. “Where you from?” I asked. “We’re from New York. We’ll be heading back this morning as soon as our trailers are loaded,” answered a skinny fellow with crooked teeth. Thinking I’d watch some news, I fished out a quarter and headed for the television. “DON’T DO THAT!” one of them shouted and poured five or six washers into my hand. “You can buy these at the hardware store for a penny each,” he added, motioning in a thumb in a direction that was meaningless to me. “Let’s go, boys,” shouted portly fellow who popped in from Wabash. “Maybe we’ll see you next trip,” one said as they filed out behind the old man . The gray-headed clerk stood watching me. I guess he read my mind when I was hesitate about using a washer. I didn’t know what to say. Evidently he wasn’t expecting a response, because he turned his attention to some book work. I had breakfast down the street near the hardware store that sold the washers, then got my bag and hailed a Yellow Cab. Curious little episode on your way to California!